When asked to write a blog for Team Boomer, I was not only honored, but also a little uncertain because I have never really stopped to think about my last ten years as a marathoner. On November 3, I ran my tenth – and final – New York City Marathon, something that was exciting and bittersweet at the same time. I ran my first NYC marathon in 2001, just eight weeks after 9/11 at the age of thirty-one. I can’t remember exactly when or why it happened – but my original goal of completing one marathon morphed into competing in and finishing ten total NYC marathons. With the exceptions of 2005 and 2007, I have consistently trained year after year with my overall goal in mind. When I wasn’t running, I was cheering my friends and teammates on because I know how important the crowd is when you are out there. I am often asked what inspires me to keep running. Initially, it was my will to complete a goal. It helps that I really like running. I like to train. Well, I like the idea of training. Prior to last year, when finally training with a group, I was what you’d call a “lazy marathoner.” That is, my training slacked the closer I got to marathon Sunday. Training with a group really inspires me to push all the way through to marathon weekend. Other marathoners inspire me. My worst runs inspire me. I do not usually need new motivation for each marathon. I just let my motivations build as each year passes. My most memorable marathon – other than my first one in 2001 – was when I began running for Team Boomer in 2008. Running for Team Boomer, for me, is a direct reflection of my special bond with my nephew Gunnar, who has cystic fibrosis. When Gunnar was very young and his sister Sydney was on the way, my sister Cheryl asked me to be their nanny – something that allowed me to have precious time with them both. Gunnar has always been my driving factor in raising money for CF, and running for Team Boomer allows me to do that. 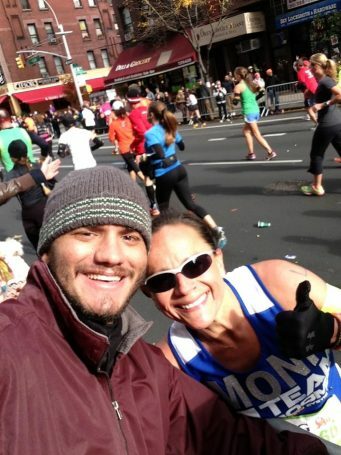 I will never forget the moment during the 2011 NYC marathon when I saw Gunnar and my sister Cheryl at mile 17; I bear-hugged Gunnar and said, “You are the reason I run. I love you so much.” It was such an emotion-filled moment that I couldn’t help but cry. After Sunday, I plan on taking the next two years off from anything endurance related. During that time I will continue my studies in the hopes of becoming a pediatric respiratory therapist. After that… IRONMAN 2020! Fun fact: During the 2008 NYC Marathon, in the middle of my then nemesis, the Queensboro Bridge, I administered CPR to a runner who had collapsed from a heart attack. We both survived that race.